Who says cloud ERP software can’t change the world? Not World Hope International. As a non-profit organization, its innovative, environmentally-conscious, and transformative projects change lives around the globe—and Acumatica’s financial management software helps them do it. World Hope International (WHI) is a Christian relief and development organization established in 1996 by Jo Anne Lyon. She set out to “empower the poorest of the poor around the world so they can become agents of change within their communities.” After 23 years, WHI is still going strong, providing vulnerable populations with the power to succeed through market-based and community-driven enterprise solutions and local and global partnerships. Part of Jo Anne’s vision involved visiting parts of the world suffering from the effects of war, famine, and oppression, bringing with her “opportunity, dignity, and hope.” Because of her immense effort, people across the globe have received the resources and the skills they need to radically change their lives. WHI empowers individuals—regardless of ethnicity, gender, race, or religion—to make their communities self-sustaining and safe. Specifically, they work to eradicate trafficking and gender-based violence (and offer programs that help victims heal), as well as aid communities through health and wellness programs, emergency relief, education, village partnerships, and child sponsorship. They also work to create access to clean water and sanitation, and the story of Loa, a young woman from Kompong Cham, Cambodia, is a perfect example of how WHI’s provision of clean water profoundly changed a life. Loa, with her husband and two children, grew mung beans and sesame. When the market for their crops crashed, they lost everything. Desperately needing a way to provide for her children, Loa learned of a new mushroom-growing program in their village. The only problem was that growing mushrooms required a lot of water, and she only had access to dirty water far away—that is, until WHI worked with the village to drill a well for clean water right in the village. With the clean water, Loa was able to grow mushrooms successfully. “It is my greatest joy to be able to provide for my family and offer a future for my children. I wouldn’t have had the opportunity to get where I am now without access to clean water,” she said. WHI’s ability to help people like Loa and her family is directly tied to their ability to get grants from such organizations as USAID or UKaid. Competition for these grants is high and the vetting process is intense. Accounting systems, policies, and internal controls are scrutinized to ensure that funds are spent correctly. With disconnected accounting systems around the world, WHI needed an integrated, cloud-based financial management software to aid them in getting their much-needed funding. They investigated various financial management systems before choosing Acumatica cloud ERP and Acumatica’s Financial Management edition. WHI was the recipient of Acumatica’s 2018 Non-Profit of the Year. VP of Finance and CFO Gayle Reitmulder accepted the award on behalf of WHI during Day One of Acumatica Summit 2019. She shared with emcee Christine Chen and the over 1,500 attendees (a record attendance) that getting grants before implementing Acumatica cloud ERP was difficult. The non-profit organization lacked visibility and real-time communication between their offices. The U.S. office was using one software while their counterparts in different countries used local applications, like QuickBooks. Gayle shared that it would sometimes take 10-15 days after the close of the month before they received a “back up of QuickBooks”, which they needed for reviewing transactions and for catching coding errors. Implementing Acumatica’s financial management software gave them real-time data, increased accuracy, and compliance assistance. “With unlimited global licenses, my entire staff across the world can work in the same system simultaneously. In the U.S., we can review the transaction as it’s happening, question anything that doesn’t look right, and catch coding errors as they’re happening,” Gayle said. For Gayle and her team, getting these grants is only possible because their business management processes support their efforts. Their success with Acumatica’s cloud ERP solution combined with the compelling difference they’re making in people’s lives made honoring WHI as one of Acumatica’s 2018 Award Winners an easy decision. If you missed the Summit, the Day One and Day Two Keynotes are available to watch now. It’s exciting to see how Acumatica’s cloud ERP solution supports WHI. Their website notes that 50% of farmers in Cambodia now have access to clean water, 3,615 health care workers are trained to reduce infant mortality, 1,500 farmers benefitted from the GRO greenhouses in Sierra Leone, and 92% of all their expenditures went to program services. “Acumatica has really transformed how we operate and how we do accounting throughout the globe,” Gayle said. That’s our goal: to use the power of cloud ERP software to transform businesses around the world by collaborating with our valued partners and by constantly improving our true cloud ERP platform. We’re proud that our cloud ERP software has helped WHI—and other organizations like it—improve the lives of so many. 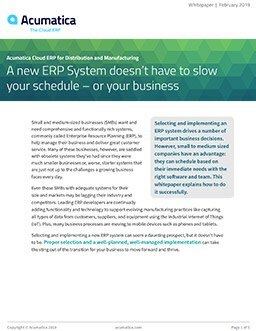 If you’re interested in learning more about Acumatica cloud ERP, please reach out to our team today. And if you’re interested in more Acumatica customer success stories like WHI, then check out our posts on Superprem, Specified Technologies Inc., Ray Allen Manufacturing, Berthold Technologies, Shoebacca, Tayse Rugs, MiiR, Firewire Surfboards, and Nothing Bundt Cakes, as well as our 2018 Customer of the Year, Fabuwood Cabinetry Corporation.